Photograph 51 by Anna Ziegler, The Nora Theatre Company, Central Square Theater, 2/9/12-3/18/12, http://www.centralsquaretheater.org/season/11-12/photograph-51.html. (Cambridge, MA) Photograph 51 chronicles Rosalind Franklin’s work, which leads to the discovery of the double helix structure of DNA. Surrounded by men, Franklin does not have a chance for her voice to be heard amongst her male colleagues. Nora Theatre Company’s production presents a truthful historical presentation of the discovery. 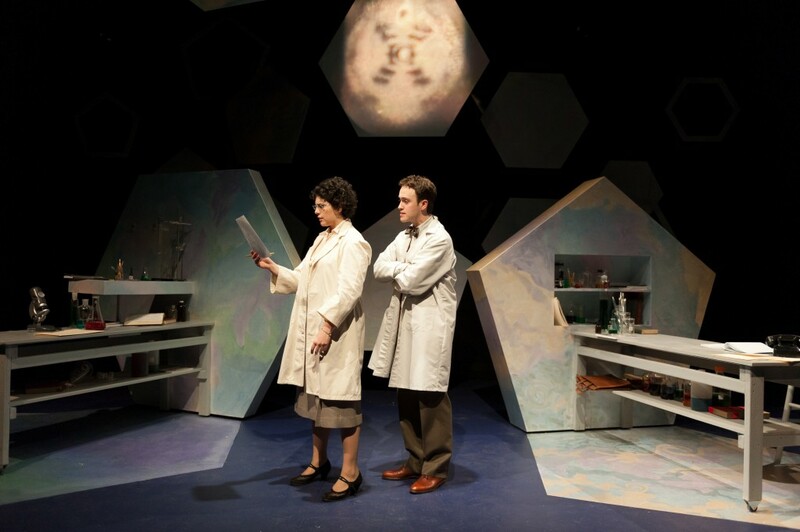 The stark geometric scenery mirrors Rosalind Franklin’s own stringent personality. Franklin, played by Becky Webber, has built up her reputation as a skilled researcher and gained a research associate position at King’s College in 1951. From the moment of her initial meeting with Maurice Wilkins (Owen Doyle), Franklin is undervalued and taken for granted. She works steadily with little interaction or respect from her peers; when the men do include her, they treat her as a subordinate, weak figure. Webber’s performance is stoic and reserved, most likely true to the real person of Rosalind Franklin. However, her character becomes secondary just as the men envision her to be. The only expressiveness and femininity she displays occurs between herself and Don Caspar (Jeremy Browne), the American researcher who she maintains a correspondence with and eventually invites to join her in research at King’s College. The accents used by the British characters, particularly Webber, are unfocused. Webber goes from a country English accent, to a Scottish accent, to an Austrian accent, and then back to an English accent. Maurice Wilkins’ truly respects Rosalind’s achievements and abilities but fails to connect with her as an equal. He treats her as a subordinate and cannot fully give her the respect that he recognizes that he deserves. He hangs out with Francis Crick and James Watson while inadvertently leaking Franklin’s discoveries. Owen Doyle brings a loving, paternalistic attitude to Wilkins. He never means harm towards Rosalind and genuinely cares about her but never is able to communicate with her in an equitable fashion. In contrast, Rosalind connects with Don Caspar, played by Jeremy Browne. Browne imbues Caspar with a strong masculinity that does not hold itself superior to Rosalind. With this strength and openness, she finally gets the opportunity to act like a woman and be desired. Jason Powers energizes the play as James Watson, the author of The Double Helix. Watson’s brash, youthful, arrogance takes every opportunity to develop the DNA model. He takes advantage of Wilkin’s congeniality by siphoning information about Franklin’s research from him. Powers breathes over-the-top cockiness into Watson, which is consistent with an extremely young, smart, successful narcissist. While he is not a likable character, he is the most interesting of all of the characters. As a device, Wilkins has created the memories that make up the play. Unfortunately, this device used by Anna Ziegler, leaves the play in the hands of the men and does not allow Rosalind to gain the respect she deserves–the respect that Ziegler obviously wants Franklin to have. Ziegler fails to develop any of the characters; the characters remain as caricatures of “types” of people rather than distinct individuals. Franklin is the frigid woman who longs to be respected first and then treated as a woman. Wilkins is the father-figure who does not understand women, and Watson is the arrogant kid who cares about nothing except his own success. The production’s sterile presentation provides little conflict. Rosalind Franklin is suppressed, and the men never understand her. Her situation is tragic, but uninspired. While this is an interesting footnote in history, Ziegler’s script lacks the dramatic movement needed to propel the story forward, a connection between the characters, and a connection with the audience. This story needs to be told and witnessed and if this is the only vehicle it’s better than no account of Rosalind Franklin at all. However, this play leaves more of a challenge to find a better way to present Rosalind Franklin that truly is worthy of her discovery. This entry was posted in Drama and tagged 2012, Anna Ziegler, Becky Webber, Cambridge, Central Square Theater, DNA, DOUBLE HELIX, February, femininity, feminism, history, James Watson, MA, March, men's club, Nora Theatre Company, Rosalind Franklin, science by beccackidwell. Bookmark the permalink.